Pikes Peak. The most famous – and feared – mountain rally of North America. Cars that attempt the 12.42-mile, 156-turn course are especially designed for the challenge, featuring huge spoilers in order to keep them grounded as they reach speeds of up to 140mph on the twisting track. We definitely don't advise trying it in your Mini Cooper. Car-buying site Carwow does, however. The Mini Cooper is in fact just one of the everyday models that the London-based team has reimagined as a Pikes Peak challenger, complete with spoilers, skirts and serious style.Enlisting the talent of graphic artist YasidDESIGN, Carwow took a Suzuki Vitara S, a Nissan Leaf Nismo RC, a Hyundai i30N, a Toyota Hilux, an Ariel Nomad, a Mini JCW Challenge, an Abarth 124 Spider, an Audi Q2, a Peugeot 108 and a Ford Transit Supervan and turned them into monsters worthy of 'The Race to the Clouds'. And they did so pretty impressively. 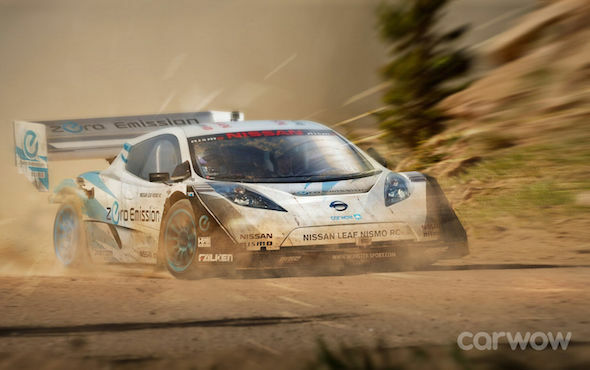 A digital rendering of each car was created, depicting them racing through the tough terrain of the Front Range of the Rocky Mountains, of which Pikes Peak is the highest summit. But it isn't all just pretty pictures. The team put some serious thought behind their choice of vehicles, stating exactly why they make the cut, what modifications would be made and which category they would compete in. The Nissan Leaf Nismo RC, for example, would benefit from a few software updates and some extra aero kit before competing in the ever-expansive electric category. Meanwhile, the Ariel Nomad would need little external modification to take on the Peak. However, its powerful Honda engine would have to be turbocharged in order to cope with the lower oxygen levels at higher altitude. Perhaps the most unusual of the hill climb conversions is the Ford Transit Supervan. High-sided and heavy, it is better suited to the pits than the mountainside, however by adding the turbocharged V6 unit from the brand's GT supercar, Carwow believes it could be a worthy challenger. Check out the full list of descriptions here.